A jump from a roof. The extreme activity was first invented in the U.S., but has since become highly popular in Russia, where it is developing both as a sport and a recreational activity. “If everyone jumped from a bridge, would you?” anxious parents in Russia often ask their children as a rebuke for doing something stupid. Rope jumping, an extreme sport that combines the thrill of rock climbing, bungee jumping and sky diving into one terrifying ride, does not seem to fit this logic. Hundreds of people around Russia jump from high locations on summer weekends, and many of them do it again and again. Maxim Maximov, a professional climber from Novosibirsk, started to rope jump in 2011. Now, Maximov and his team organize rope-jumping events for the general public. There are five such rope-jumping teams just in Novosibirsk, and in Moscow this number touches 20. 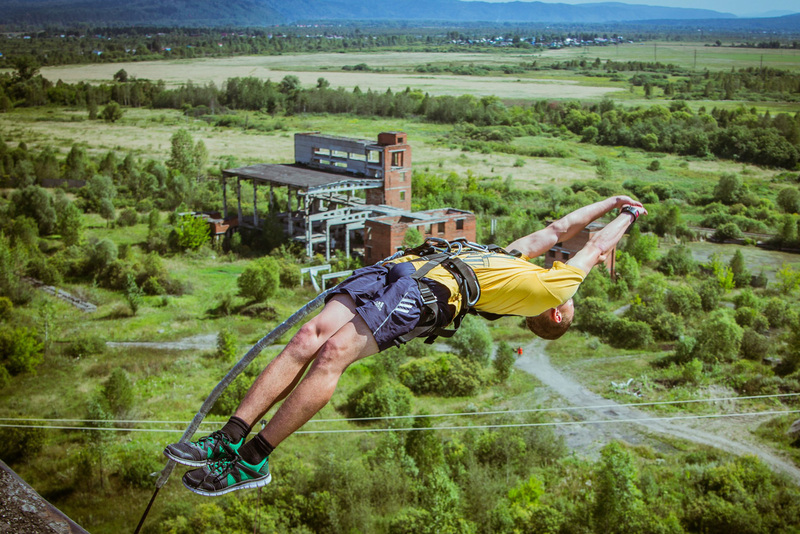 Russia-wide, there are more than 50 teams that organize rope jumps, Sergey Firsov, leader of the first rope jumping team in the country, told RBTH. It was around 17 years ago when Russian alpinists learned about rope jumping. The activity was invented by American climber Dan Osman in the 1990s to help alpinists overcome their fear of falling from a mountain. The inventor himself died in 1998 performing a “controlled free-fall” jump, but this did not stop the first Russian rope jumpers. “In 2000 I saw Dan Osman’s film ‘Masters of Stone 5’ and encouraged my friends to try jumping. We have been jumping since then,” Firsov shared. Over these years Russia has become the top country in the world when it comes to the number of rope jumping teams. The majority of these teams comprise of members with professional experience in alpinism. According to Firsov, there are around 70 teams in the world, and the majority of them are Russian. There are teams in Ukraine, Poland, Latvia and France, but their number is much smaller when compared to Russia. Surprisingly, in the U.S. – where the activity was invented – there are practically no rope-jumping teams at all. Jumping from bridges is illegal in the country. Often one can see a “no jumping” sign near the majority of bridges. In Russia there is no legal framework for dealing with rope jumpers and the status of rope jumping is uncertain. This creates opportunities for local amateur teams to organize regular jumps for everyone interested. Teams even advertise jumps online. Rope jumping became popular among the public because it’s quite affordable and does not require any specific skills, as opposed to parachuting, for example, which is more expensive and requires serious preparation. For rope jumping one only needs to be in good health and be older than 18. Over the last decade Russian media outlets have reported only three tragic incidents that arose from rope jumping. A young couple died in the Sverdlovsk Region in 2010, and a girl each died in 2015 in the Murmansk Region and Primorye Territory. Given that hundreds of jumps are attempted across Russia each year, the number of fatalities is quite low. “Generally, instructors take rope jumps very seriously,” says Firsov. “Rope jumping is quite safe if a person does everything that an instructor says. A risk of equipment failure is very low because everything has a double: There are two ropes and two shackles,” he explains. Everything is always double-checked, Maximov adds. “Teams test the ropes repeatedly with loads up to 100 kilograms and if everything is set, instructors jump first. If everything works correctly, the organizers let the first-timers jump,” he points out. In both activities, however, the human factor is key. A serious attitude to security and numerous tests ensure that every potential risk is minimized. For those who are interested, there is no particular difference between rope jumping and bungee jumping. What prompts them to take a jump is simply a desire to do something exciting. Anton Burukhin, a sales manager from Moscow, wanted to do something extreme and recently took a 69-meter (226 feet) bungee jump in Sochi for the first time. “When I was going to AJ Hackett Skypark I was very nervous, but on arrival the anxiety went away,” he recalls. “I didn’t want to look down and get scared, so I simply went for it and jumped.” He now plans to jump again but this time from 207 meters (679 feet). For those who do it for the first time, jumping is a way to test your limits, fight your fear or simply discover new emotions. It is an affordable entertaining attraction that costs on average 1,000 rubles ($17) in Moscow and around 150-200 euros in Poland and France. She has already jumped more than 20 times and even jumped from one of the highest locations (230 meters or 754 feet) for rope jumping – the Shaan Kaya rock in Crimea. Will it evolve into a recognized sport? For active teams that organize such events, rope jumping is a passion. In the beginning it was simply a training component for alpinists. Today rope jumping has more and more features of an independent sport. Rope jumpers from different cities go on joint trips, share experiences and compete against each other. They set ambitious goals that are not possible without good physical preparations and motivation.